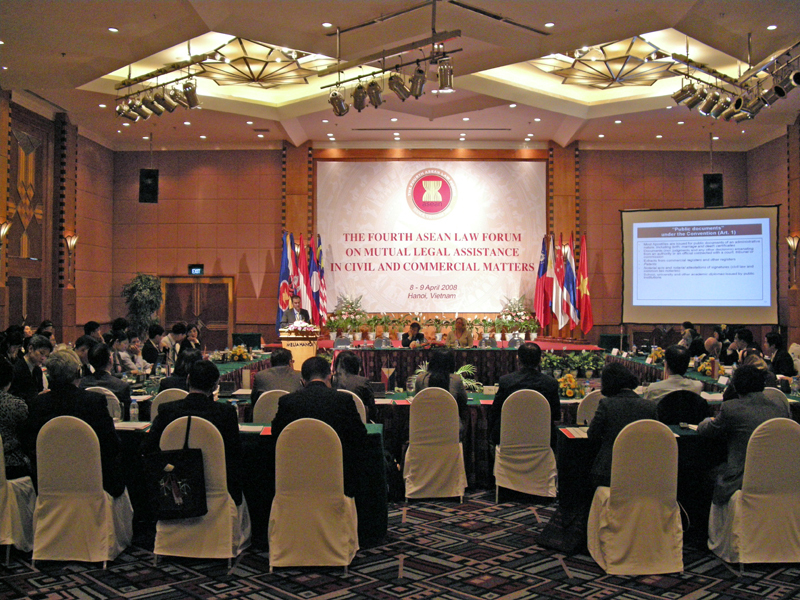 On 8 and 9 April 2008, the Fourth ASEAN Law Forum on Mutual Legal Assistance in Civil and Commercial Matters was held in Ha Noi, Viet Nam. The Forum, hosted by the Ministry of Justice of Viet Nam, was attended by experts from the ASEAN Member States - Brunei Darussalam, Cambodia, Indonesia, Laos, Malaysia, Myanmar, Philippines, Singapore, Thailand and Viet Nam - as well as by representatives from the Hague Conference on Private International Law, Australia and China. The participants discussed measures to strengthen legal co-operation among the ASEAN countries in civil and commercial matters, and also shared their experience as Parties to the Hague Conventions of 5 October 1961 Abolishing the Requirement of Legalisation for Foreign Public Documents (the "Apostille" Convention) and of 15 November 1965 on the Service Abroad of Judicial and Extrajudicial Documents in Civil or Commercial Matters.